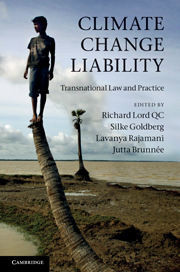 “Climate Change Liability – Transnational Law and Practice”, edited by Richard Lord, Silke Goldberg, Lavanya Rajamani and Jutta Brunée, Cambridge University Press, Cambridge 2012, ISBN 978-1-107-67366-3. To our knowledge, this is the first book comparing the law of different national systems under the aspect of climate change liability, the major topic of this blog. It has been written by more than 40 authors and is of good average quality. Accordingly, we present detailed summery of the content of this book. When doing so, we focus on one of the two types of liability: private liability (discarding public liability). We summarize the various contributions in a view of indicating the chances of victims of climate change to sue polluters successfully. For some of the states examined in the book, our summary is very short, regardless of the length of the original text. The number of climate change liability cases increases, and so does the number of types of cases. In the so far pioneering United States, the decision on Connecticut v. AEP slowed down the run of private law damage claims. There is an increase of “indirect” or “ancillary” private liability cases. The number of public law claims increases as well. Regulation and jurisprudence developed for other purposes is often “transposed” into the new field of climate change liability. Developing countries' courts are becoming a new arena, India being the most prominent and promising case. The classic distinction between rich polluting countries and poor victim countries might gets blurred. The less regulation on climate change is successful, the more climate change litigation gains importance. Climate change liability (or the prospects therefore) influence the behavior of public and private operators (from regulation over rating to business planning).